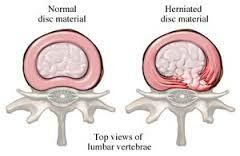 How does auto crash cause a herniated disk? A herniated disc injury to your spine often occurs in an automobile accident. The stress put on the spinal column in a car collision can cause a piece of the spinal structure (called a disk) that separates your back bones or vertebrae, to move out of place. These injuries are sometimes also called slipped or ruptured disks. These disk structures can push out into the spinal channel and press against spinal nerves, producing severe back, neck, leg pain and possible hand pain. If you experience a sharp pain in the back, leg, hand or foot after an accident you should see a doctor immediately. Back injuries caused by slipped disks can be a lifelong problem. They can be caused by a single car accident. Many accident victims do not seek legal advice until it is too late. After an accident, back and neck injury problems sometimes go unnoticed and undiagnosed, the victim hopes that the pain will simply fade. In some cases people recover fine, in others a disk has been dislodged and a lifetime of uncompensated back pain begins. If after an accident, you notice any of the symptoms below see a doctor and then consult with a personal injury lawyer. Back Pain: If you experience sudden and intense back pain it is a strong sign that a disk injury may have occurred. Lower back pain is the most common symptom since the most likely disks to herniate in an accident are the bottom two discs in the spinal column. Ruptured discs in the lower back put pressure on the sciatic nerve causing sharp pains in the legs extending into the feet. Over time, pressure from this disk can cause chronic pain and numbness, and the back muscles in the affected area may weaken and become damaged. Numbness in back or legs or hands. A herniated disk can cause numbness in the calf, foot, toes and hands and fingers. The injured person may have difficulty walking or performing daily activities. Any other strange sensations in the back, legs, toes, hands or fingers that occur after an accident such as weakness or tingling may be from a slipped disk. Car insurance companies have conditioned many people to think that all back and neck related complaints from car accidents are minor and not worthy of compensation. In fact, car accidents represent a large percentage of serious back injury cases in the United States. A serious back problem may lead to a chronic pain, inability to work and lost productivity. A herniated disk claim should be handled by an attorney who concentrates on personal injury cases. The Law Offices of Aronberg, Aronberg & Green concentrate solely on personal injury cases. We have combined 38 years of trial and personal injury experience. Please call the Law Offices of Aronberg, Aronberg & Green at 561-266-9191 for a Free Consultation at No Cost or obligation.